First in a series. Our work as Christian leaders is to cultivate thriving communities that are foretastes of the kingdom of God. The Acts of the Apostles pressures us to see six features that are the essence of the church, writes C. Kavin Rowe. Indeed, the first real communal problem in the church -- a threat to its thriving -- occurs when the so-called Hellenists (Greek speakers) complain against the Hebrews (Aramaic speakers) because the Hebrews are neglecting the Greek-speaking widows in the daily distribution of provisions. Acts devotes only a few sentences to this controversy (see 6:1-6), but we know it seriously threatened the church because all 12 apostles appear on the scene, and they, in turn, summon the other leaders and develop an authority structure (deacons). 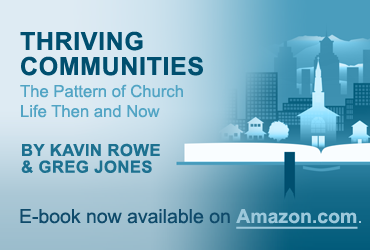 By developing a lasting structure to deal with the potential rupture in the church, Acts displays what becomes a central feature of the thinking of the church’s leaders: they look beyond the need to “fix” a problem (of which there are several in Acts) and instead think about thriving in a much longer-term perspective. That such a long-term, structurally focused perspective is powerfully depicted in relation to the provision for the weak should be no surprise to the reader of Acts: as Acts says explicitly in its depiction of Christian life in 2:41-47 and 4:32-37, provision for all is fundamental to the thriving of the early Christian communities. In our day it is all too easy to equate articulacy with intellectual sophistication. But according to Acts, this equation would be a mistake. In Acts 4 Peter and John are taken before the Jewish authorities and asked by what name they have healed the lame man by the Beautiful Gate (Acts 3). Peter replies to their request with a short sermon. The authorities, says Acts, are stunned at the power of the sermon, because Peter and John are “uneducated, common men” (RSV). The Greek here literally says “illiterate idiots” (agrammatoi kai idiōtai). In Acts, to be articulate is not necessarily to be sophisticated; it is quite simply to be able to say what is the ultimate reason for the community’s existence (by what name it lives). Knowing the ultimate reason for a community’s existence, however, is not automatic, a given, something that magically appears in one’s head upon joining. Much to the contrary, it has to be taught and transmitted. The necessity to teach the community’s raison d’être is nowhere seen more clearly than in the first and paradigmatic episodes in Acts (chapters 2 and 4). Upon joining the church, we are told, the new converts devoted themselves to the doctrinal instruction (didachē) of the apostles. The new Christians learned, therefore, what the new life was that they had embraced, what it meant to be Christian. Here, as with the processing of disagreement in Acts 15, we can see traditioned innovation at work in bringing to life and sustaining a thriving community.